We are really excited for the upcoming Vancouver Island Baby Fair – happening on Saturday, Sept 24th & Sept 25th in Victoria at Pearkes Arena. Not only are we officially launching our 2 new games – Story Starters DRAW and SUPER Story Starters, we are also going to be up on the main stage! Join us as we explore 50 common household items that you can re-purpose for playtime! We guarantee your kids won’t look at a potato masher the same again. And…we hope their creative problem skills and lateral thinking will be all the better for it! Weekend passes are just $7, day passes $5 – tons of great vendors, baby & child related information…and The Kerplunks! We are going to be interviewed this Saturday, September 10th on Real Parenting on CFAX out of Victoria, BC by radio host (& producer of the Vancouver Island Baby Fair) Shirley Broback. Listen in to hear Spark founder, Tamara Vukusic talk about re-purposing for playtime! You know how when there is something that pushes you out of your comfort zone you can find at least a dozen excuses not to do it. At this time, your bath tub usually is spotless. Groceries bought. Bills paid. Well…you could say this challenge is our little ‘motivation’ to get out of the comfort zone, and get on the phone! Like most people, cold sales calls push us out of our comfort zone (in fact, you might even say, it pushes us into a cold sweat! ), and with 3 children under the age 6, it is REALLY easy to come up with reasons why calls to new retailers didn’t happen that day! But, we really believe in Spark, and we are REALLY excited about the 2 new products we are launching this fall. And, the only way we are going to get them in the hands of Canadian families, is to get them into the stores where Canadian families shop! 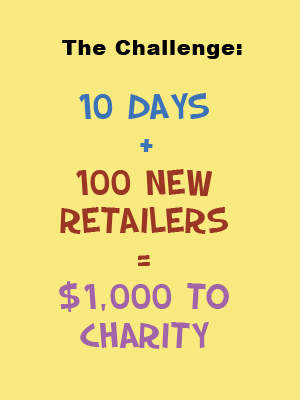 We believe in the ‘go big or go home’ philosophy, so we are challenging ourselves to find 100 new retailers in just 10 days! Our kick off is Monday, September 12th and we’ll wrap up on the 23rd (we need every day we can get, so the Sunday won’t count!). We would truly appreciate your help. So, if you happen to know a great spot that you think would be interested in Spark games, let us know! Looking forward to discovering some great new places across Canada!